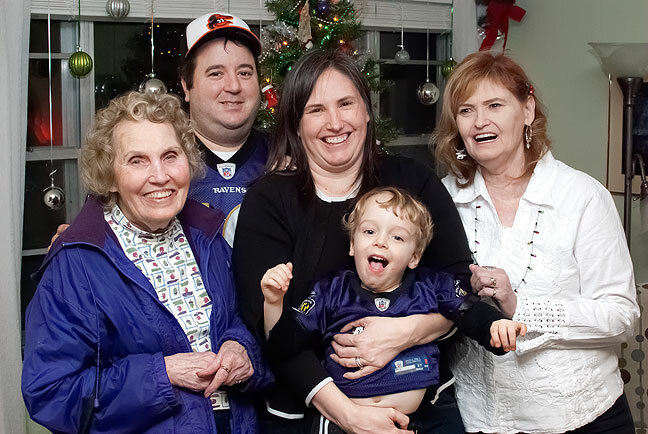 Some of the kin: Dorothy,Tom, Chele, Paul and Abby pose for an image. For anyone keeping score, Dorothy is Chele’s grandmother, Tom is married to Chele, Paul is Tom and Chele’s son, and Abby is my wife and Chele’s mom. Abby and I put the kids on their plane to Baltimore two days ago at Dallas Love Field, an airport I like better than Dallas/Fort-Worth by a factor of one jillion. On our drive home we stopped for a late lunch at Cracker Barrel, where we had an excellent meal and bought the entire first season of Have Gun, Will Travel, one of the seminal shows of Abby’s childhood (mine being Star Trek: the Original Series) on DVD. Abby and the dogs relax after opening Christmas presents. I think my wife looks amazingly beautiful in this image. Cracker Barrel bought in to a controversy that is popular across the nation currently, stemming from a reality-television personality making some incoherent comments about the Bible and homosexuality. I won’t go into details since you can certainly look them up for yourself, and because the whole thing is an embarrassing example of the shallowness and distorted priorities of society as a whole. Cracker Barrel removed some merchandise, hoping to please its customers, then put it back on the shelves after an outcry, amplifying the shallowness and re-emphasizing that nothing matters more in the West than money. Nevertheless, it was a delicious meal, and a nice time with my wife. I went by Wal Mart yesterday to get a few things, including a Cornish game hen for Abby’s Christmas dinner tomorrow. I thought I had seen all the idiocy that big box stores and their moronic, myopic, monstrously ugly clientele could offer, but my visit to the store two days before Christmas proved me wrong: dozens of scooters with obese people parked sideways in aisles as they read ingredients on food they should not be eating; dead-eyed soccer moms buying as much junk food as their carts would hold; self-involved cretins dragging their nagging, crying, fit-pitching children thought the aisles, then repeatedly ignoring people who said, “excuse me,” probably because they couldn’t hear over the squalling of their filthy, undisciplined kids. It went on. I am glad to be home with my wife now. Other than dinner tomorrow, we don’t have much planned. I expect I’ll clean the house a bit. Maybe we’ll play with our Christmas presents. 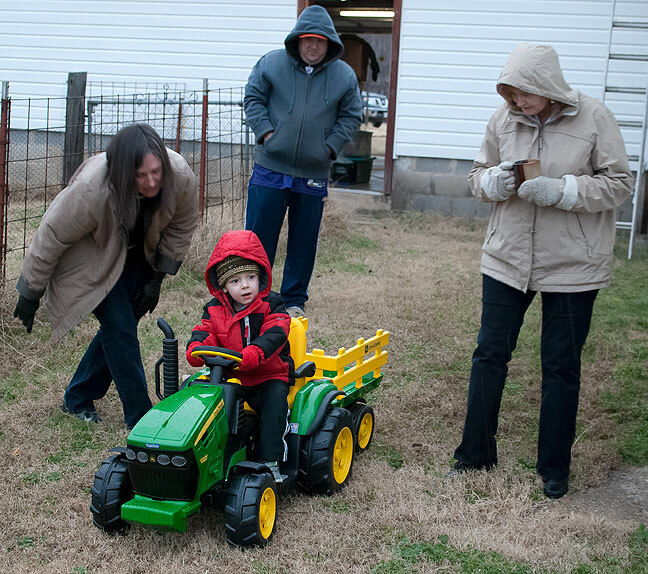 Flanked by Chele, Tom and Abby, Paul rides his new toy lawn tractor in our back yard in freezing rain. Tom helped me assemble it, and we found it to be put together in much the same way as our real John Deere lawn tractor. That tractor is so fine I kind of want one for myself! I do like the tractor. Advice: If you’re going to go into Walmart* at all, don’t do it between Thanksgiving and Christmas. Especially those last few days. We were fortunate that we didn’t have a reason to (skipped Marline’s famous ham this season because of the full Walmart parking lot). * “Walmart” is apparently how they’re spelling it now.